Somehow we’re here again, caught off guard by how quickly the holiday season came upon us, how close to the end of the year we are, and how many things we meant to do that remain on our to do lists. But it’s not too late to get ahead of the holiday. Need a gift for a smart commuter – someone who carpools, rides a vanpool or bus, walks, bikes, or works from home? Whether you are shopping for yourself or a friend, we’ve got you covered. A smart commute is more than just a ride to work; it’s the gift of free time…of relaxation, a few extra dollars in your pocket every month, new friends, and fresh air and exercise. Give yourself the gift of leisure as you ride to work on a Club Red vanpool, WiFi-enabled bus, or in the passenger seat of a comfy carpool. 26% of Americans admit they haven’t read even part of a book in the past year; however, research shows that people who read 30 minutes per day experience more peace and better sleep (Pew Research Center, 2018). Take back that time wasted sitting behind the steering wheel and put it to better use as a smart commuter! 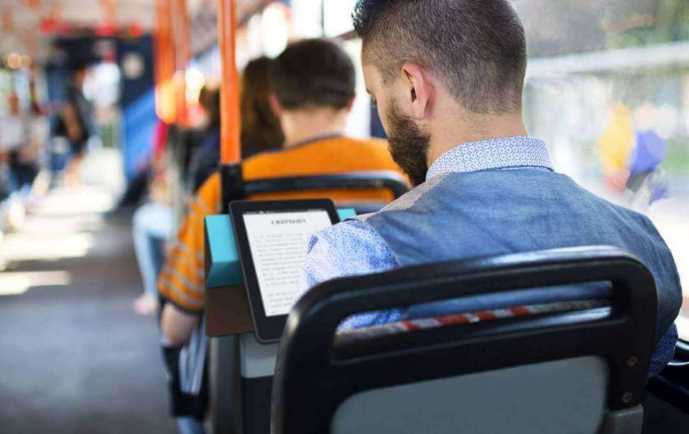 There are many options to choose from when it comes to an e-reader – Kindle’s new Paperwhite, Barnes & Noble’s Nook 10.1”, a tablet with reading apps, and more. You may be thinking “who would get excited about bike saddlebags for the holidays?” About 6,000 people in the City of Boise alone, actually. According to the US Census, roughly 2.5% of Boise workers commute by bicycle (2016). These cyclists save money on fuel and vehicle maintenance, turn a stressful commute into an invigorating exercise, and do their part to reduce the number of vehicle miles traveled on our roadways. 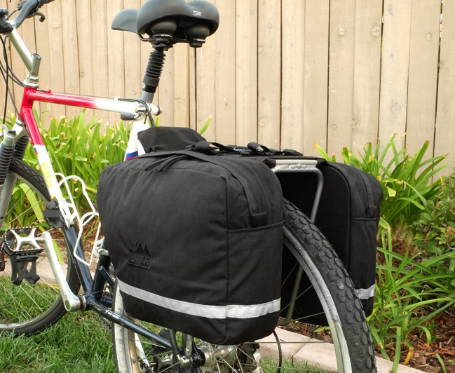 Saddle bags like these from local George’s Cycles and Idaho Mountain Touring provide a safe, weatherproof space to store and transport a laptop and other work and personal items while biking to work. Coffee and commuting go together like PB&J, so a nice travel mug is a no-brainer. Whether you vanpool, carpool, bike, or walk – carrying your caffeine confidently is important. A great travel mug keeps your coffee or tea hot, doesn’t spill, fits in a cup holder nicely, and is easy to sip from. We recommend the Camelbak Insulated Forge travel mug for your everyday coffee needs, or this beautiful tumbler with our very own Boise foothills in gold on a matte black mug from Slow by Slow in Boise. Here’s a gift any commuter will enjoy – wireless earbuds! Wireless is a great option for all kinds of smart commuters, but we suggest bicyclists keep one ear free to listen for traffic, sirens, and other potential dangers. Pair your gift of earbuds with a personalized playlist (the modern mixtape, always a thoughtful gift! ), Audible subscription, or podcast recommendation. One of the best things about smart commuting is getting some free time back and being able to relax – so turn up the volume and take advantage! These Soundcore wireless earbuds have great sound quality, a sleek design, and they’re comfortable. Techie gadgets always seem to make people smile on Christmas morning, especially those that make life easier. No, we’re not suggesting a robot who does laundry, dishes, and meal prepping – one can only dream. But, how about a noise-canceling headset for people who work from home? Be sure to choose a lightweight headset that’s comfortable and reduces strain on the neck. Plantronics headsets like these are widely used in call center environments and have headsets for both landline and PC ports. *Disclaimer: ACHD Commuteride does not endorse specific brands or products; these suggestions are simply ideas we think your smart commuting friends and family would enjoy. Happy Holidays! E-Scooters: They’re here, but are they helping? But…do e-scooters have the capability to make smart mobility easier and more attractive by connecting people with their destinations? Most people in the United States are comfortable walking less than a ¼ mile to or from destinations, including public transit stops. But what about when a person is further than a comfortable distance? Only 33% of Ada County households are ¼ mile or less from a transit stop. The remaining 67% of households experience what transportation planners have long struggled with: the “first/last mile” problem. What is the first/last mile problem? It’s pretty simple – residential areas are usually far from destinations and public transit doesn’t take us exactly where we need to go. So, often the first or last mile of the trip presents a problem. If it’s not convenient or comfortable to access a smart mode of transportation – a bus stop, park and ride lot, or safe sidewalks and bike facilities – transportation options are limited, usually to driving alone in a personal vehicle. Ridehailing apps like Uber and Lyft can help with accessibility, but don’t reduce the number of vehicles or miles traveled on our already congested roadways. Enter: e-scooters? With the arrival of nearly 500 e-scooters in Boise, it begs the question…could e-scooters provide a first/last mile solution? Could they help reduce the number of vehicle miles traveled in our community? Let’s take a look. After downloading the Lime and Bird apps and getting set up, we started our trip from the Broadway Avenue/Front Street area to Boise City Hall on Capitol Boulevard/Main Street. We wanted to test a typical midday trip someone working downtown might make for a meeting. Off we went! Helpful tip: Set up is easy, but make sure you have your credit card and driver’s license handy! Riding the scooters was easy and fast. We arrived at City Hall in seven minutes, including waiting at crosswalks. The total route was ¾ mile and cost $2.40. Looking around, I felt confident I’d find another scooter to get back across town after our meeting. The map showed tons of Birds in walking distance! Helpful tip: Be sure to park the e-scooter out of the way of vehicles, pedestrians, and bicyclists! Uh oh! After the meeting, all the Bird scooters around us were experiencing a connectivity issue. This could be problematic if the Bird scooter was my only viable transportation option. Luckily, we both found nearby Lime scooters to use (or I could have walked, if time allowed). The return trip took nine minutes and cost $1.35. So, was using an e-scooter a longer and more expensive trip than if we had driven the ¾ mile to our meeting? We tested that, too… We compared the time and cost of driving vs. using the scooter. It is important to note that in this one-time experiment, we were very lucky to find an on-street parking space immediately. First/Last Mile…Maybe: Bird and Lime scooters have the potential to provide a first/last mile solution, however – reliability is key. There is no guarantee a scooter will be nearby when you need it. If your first/last mile trip is manageable on foot, keep the scooter option in your back pocket for when it works but be prepared to hoof it. Boost Downtown Economy: Scooters may not be a reliable commute option, but they sure do make getting around faster, which might pay off well for the city’s local economy. Several users we talked to were able to expand their lunch and shopping destination options because of the availability of the scooters. Feel like sushi but it’s 10 blocks away and you’ve got to be back for a meeting in 30 minutes? Not a problem if you can snag a scooter! Park Once: Short scooter trips are great for those who don’t drive/want to drive during their workday. Our friends at the City of Boise have coined the phrase “park once.” The park once goal is to ensure that visitors don’t need a car once they arrive at their destination because there are other safe and comfortable options, such as walking, biking, transit, or – scooters. Case in point: we talked to a BSU student who interns three days a week downtown and uses the scooters to travel between campus and work, thus only having to park once. Moms all over the world have repeated the same stranger-danger mantras to their kids for years: Don’t talk to strangers! Don’t take candy from strangers! And never, ever, under any circumstance, get into a stranger’s car! Well, sorry moms, but millions of people are hopping into a perfect stranger’s car every day. Ridehailing services like Uber and Lyft have quickly become one of the most convenient ways to get around, but they’re more suited to quick trips here and there than daily commutes. Traditional ridesharing may not sound as trendy when you call it what it is – carpooling and vanpooling – but it’s definitely a smart choice for those who want to save money on gas and parking and reduce routine maintenance on their personal vehicles. 1. Use MyCommuterCrew.com to find ridesharing opportunities and partners – you never know who may live and work nearby who would like to share a ride! 2. Check with your employer for smart commute benefits and subsidies – many businesses offer to pay all or a portion of your parking fee, bus fares, or vanpool fares. Some even provide financial incentives to walk or bike to work! 3. Take advantage of a transit benefit – if your employer includes transportation as a pre-tax benefit, you can use up to $260/month in pre-tax dollars to pay for your transportation expenses. Cha-ching! If finding a vanpool or carpool sounds like a lot of work, don’t fret. Commuteride can help! Give us a call at 345-POOL or visit mycommutercrew.com to find options specifically for your commute! Ah, yes. Construction season means you may be driving through cones, chipseal, and construction flaggers. We are in the midst of the Ada County Highway District’s biggest construction season ever. Move over Snowmageddon, it’s time for Constructionmageddon to take the spotlight. It’s no small feat to find a route to work that hasn’t been touched by the $61 million dollars ACHD is investing in the county’s transportation season this year. Of course, when all is said and done, our commutes will easy-breezy and safer – here’s to counting down the days! But heavy construction isn’t going anywhere anytime soon…you may have noticed that our valley is growing exponentially and we have to make room for all of the additional residents and businesses – and therefore the additional traffic – that comes with the growth. But fear not, faithful commuters! Getting to and from work doesn’t have to be a drag, drain your wallet, or waste two hours of your day. Commuteride has got you covered! Tempted? Intrigued? Visit mycommutercrew.com or call 345-POOL. You might decide you like saving money, making friends, and getting free time back and stick around even after “construction season” wraps up! Let us help!